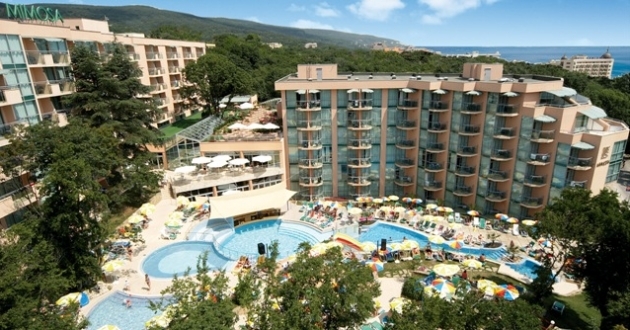 Location: Situated in the centre of the resort, 200 m from the beach. Built in 2002. Accommodation: 331 rooms, studios and suites, all with A/C, Sat-TV, telephone, mini-bar, WC/shower or bath-tub, balcony. In the hotel: Terrace restaurant, a-la-carte restaurant, lobby bar, barbeque restaurant and pool bar, 3 outdoor swimming pools and 3 children pools, indoor pool with children's section, day-time sport animation around the pools, regular evening show programs on the open-air stage, kids club for children 4-12yrs and kids disco; table tennis, darts, fitness, billiards, safety deposit boxes, internet and computer games room, shop, pharmacy, dentist, hairdresser, conference hall. SPA facilities: Modern SPA center for physiotherapy and balneotherapy with mineral water including consultations with a physiotherapist, electric treatment, mud treatment, paraffin treatment, tangentor-baths, aromatherapy baths, thalassotherapy, solarium, sauna, medical rehabilitation massages, dermosonic, press therapy, face and body cosmetics, possibilities and programs tailored to the client's wishes. Also at the guests' disposal are a therapist, dentist, pharmacy.